The author’s experiments with small framed S&W revolvers, like the Chief’s Special and J Frame revolvers, proved that they are some of the most effective point shooting pistols! Point Shooting is generally recognized as the skill of discharging a firearm quickly, usually a hand-gun, in self defense, with minimal or no use of the sights on the gun. While this skill always works good in the movies, especially cowboy movies, in order to point-shoot well in real life and death situations, a certain amount of self-education or formal training is required, along with as much practical practice as possible. While fast draw may be considered by the uneducated to be the same as point shooting, it is in fact an entirely different animal. Fast draw should not be of primary consideration to those who truly wish to master point shooting for real life practical self defense in genuine life and death situations. In practicing point shooting, being quick on the draw will come, but should be secondary to point shooting itself. Some gunfighters of the old west used point shooting techniques but very little is available to document this. E. A. Sykes and W. E. Fairbairn, once of the Shanghai Municipal Police before the Japanese occupation, are generally acknowledged as the fathers of modern point shooting development and Colonel Rex Applegate of the military’s Office of Strategic Intelligence (OSS – Precursor of the CIA) is credited with documenting and bringing it into popular use for clandestine military operations. Many books are available that paraphrase their work, at great length in fact, in promoting the art of point shooting during WWII training of OSS agents. Throughout this time however, point shooting was practiced by shooting advocates in law enforcement. Why Master the Shooting Discipline of Point Shooting? In a nut-shell, real gun fights happen in low light conditions, at very close ranges. Things happen so quickly in a real life threatening situation, that citizens, soldiers, and police find that skills learned in the formal target shooting arena have evolved more to provide shooting range safety than deadly force in self defense. In real shoot-outs, people automatically assume fighting stances that are contrary to formal target shooting. Point Shooting instead takes advantage of these natural physiological reactions of the human body, and is thus based on fighting stances that the human animal will automatically assume when challenged and threatened. In order to Point Shoot effectively, one is best served to practice point shooting with the weapon they will be using in a real situation. What is essential to recognize, is that different guns of various styles and configurations, provide significantly different results when used for Point Shooting. Generally speaking, any pistol will work. However know that different guns, when fired quickly without focused use of the sights, will impact very differently at the target due to differences in weight, recoil, and probably most importantly, the ergonomics of the pistol’s design. People are built differently too. A firearm that one man can quickly master for the purposes of point shooting, may be ineffective for another equally skilled shooter. For practical purposes, stick with one style of gun for the purposes of point-shooting. The gun or type of gun should be the one you’ll most likely have with you in a life threatening situation. *The following notes on point shooting are based on limited experimentation performed by the author. You results may, and probably should vary, depending on your choice of weapon, and your individual physical characteristics. 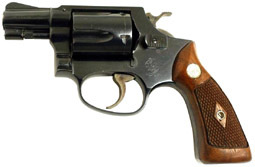 The authors experiments with small framed S&W revolvers, like the Chief’s Special and J Frame revolvers, proved that they are some of the most effective point shooting pistols. The pistols, when provided with older style original S&W wooden grips, provide consistent accurate grouping when utilized for one handed point shooting. When used with the newer style rubber grips, the guns are less effective for the sake of accuracy when used for point-shooting. 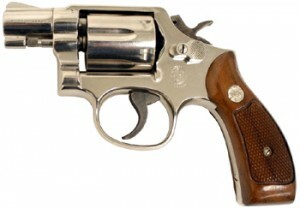 The standard and larger K Framed S&W revolvers, while more accurate than the snub nose revolvers at aimed fire, are much less effective for the purposes of point shooting than the snub nose revolvers. In point shooting practice, the medium size S&W pistols tend to lay fire very high and bit to the left. It it the authors opinion that much practice would be required to master effective one handed point shooting with such a revolver, if mastering point shooting with such a weapon is in fact possible. Such a weapon however, may prove to work well for different people, or for two handed point shooting use. Experiments with military model small frame automatics yielded poor results overall for the author. Shots were very unpredictable, except at very very close range. However, considering their intended design and rapid fire rate, small frame automatics may be acceptable for close range self-defense. Note reports of Keltec’s producing good results. Large frame automatic pistols yielded various results. It is with the automatic that small differences in the gun’s design become very significant for the purposes of point-shooting. 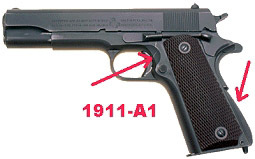 For the authors experiences in practicing point shooting, the 1911A1 model produces better results than the standard 1911 design. Note the subtle differences in the designs of the two old fine pistols. Raising the backstrap changes the pointing attributes of the gun significantly for the purposes of point shooting. 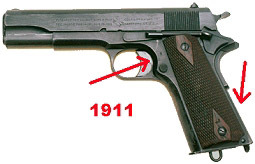 In addition to government model differences, most pistols, including newer 1911 style pistols, tend to be slightly thicker than the old G.I. pistols which will also vary the pointing characteristics significantly. In general, the larger automatics work very well for point shooting, but considerable patient practice is necessary. The gun should be raised from below and pointed at the target, rather than held in the air and lowered at the target. The large automatics will work fine for point shooting, and an additional advantage of the large frame automatic is the high volume of firepower than may be delivered very quickly to the target. Note that WWII G.I. vets report that the Luger, with it’s different geometry and light weight front-end, may point-shoot best when pointed at a target from the raised position rather than from the pointed down position. 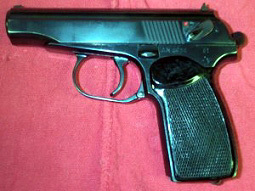 This may be similar for the Nazi P38’s as well as the U.S. Military Beretta 9mm which is based on the Nazi P38 design. 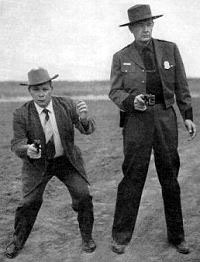 Jelly Bryce uses Gunman’s Crouch, while Bill Jordan uses classic lawman attitude; standing tall. 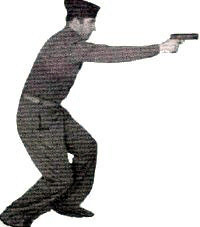 Applegate uses a slight crouch which is more useful for continued movement during a shootout and brings his 1911 45 automatic into a “sight plane” without actually using the sights to maximize accuracy. Try both methods to see what works for you. Both men were fast and deadly.